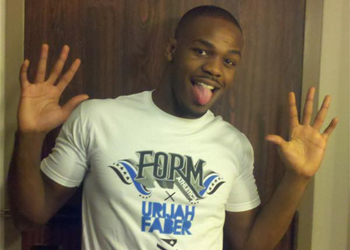 “Just gotta crazy call from dana just now!” Jones tweeted Monday afternoon. However, before the 23-year-old could reveal his latest accomplishment, UFC president Dana White promptly stole his light heavyweight champ’s thunder. “Congrats @jonnybones 1st UFC fighter to do the The Tonight Show with Jay Leno. The hits keep on coming!!!! Tune in thur on NBC!” White subsequently posted. Hopefully, Jones’ cameo on the peacock station will blast open the doors for the Octagon to host future shows on the network. Regardless, this type of mainstream exposure should do wonders for MMA, the UFC and its latest superstar. UFC heavyweight king Cain Velasquez was a guest on TBS’ “Lopez Tonight” after beating Brock Lesnar last October. “Bones” steamrolled Mauricio “Shogun” Rua this past Saturday at UFC 128 to capture the 205-pound title. “The Tonight Show” airs weeknights at 11:35PM/10:35PM CT on NBC. Per White, fans can expect to see Jones’s episode this Thursday.